I hear it’s winter somewhere. We’ve had highs in the 70s almost every day, so it’s often weird to remember that there’s snow on the ground in literally every other state but ours. For those poor cold souls, here’s a nice shot of summer freshness for you! With the option to make it a warm, comforting, but still fresh and bright, meal too! For myself and my husband, I made the salads. The tangy dressing with the delicious marinade, creamy avocado, and peppery bite of the grilled veggies – so good. But THEN, put the chicken and veggies on top of the savory rice, and the whole flavor profile changes! The marinated chicken takes on a completely different personality! I’m still floored by how versatile this fresh marinade is. (The marinade, which doubles as the dressing, does have chili flakes in it, but it really doesn’t translate to spicy heat, just great zesty flavor.) I can’t wait for leftovers! Combine marinade ingredients in a liquid measuring cup and whisk well to emulsify. Place chicken in a shallow dish; pour half of marinade over chicken. Cover remaining marinade with plastic wrap and save in the fridge to use as salad dressing. Marinate chicken 2 hours or all day. If making rice, start the rice. Cover and simmer on low 15 minutes, then leave covered until ready to serve. Heat your grill pan to medium-high and spray with soy-free cooking spray. Grill chicken until done on both sides, with nice grill marks. (I like to cover the pan while the second side cooks so that it heats evenly.) When done, set it aside on a warm plate and cover to rest. Remove any burned bits from the grill pan, spray again with cooking spray, and add the pepper and onion slices. Grill to desired doneness. Salad: lettuce, avocado, sliced chicken, and pepper and onion slices. Whisk the dressing again and pour over the salad. Rice bowl: rice, sliced chicken, pepper and onion slices, and anything else that sounds good! Flourless double chocolate peanut butter muffins. Not much to say about these muffins, except they’re quick, easy, and delicious! Don’t be dubious of the pumpkin – you can’t taste it at all. All it does is make these muffins incredibly moist! (And add a little extra veg to your daily intake…) This recipe yields about 18 muffins, or a dozen each of standard and mini muffins. The cupcake liners are purely optional; as you can see from the photo, the papers were practically falling off of the muffins straight out of the pan, and the mini muffins did just fine without liners of any kind. Preheat oven to 350 and spray wells of muffin (or mini muffin) tins with soy-free cooking spray. Combine all ingredients except the last in a large bowl with a rubber spatula. You’ll have to stir quickly at first to get the peanut butter to incorporate, but soon it’ll all come together. Stir in the chocolate chips. Use a 1/4 cup (for standard) or 1/8 cup (for mini) triggered ice cream scoop to divide the thick batter into the wells of your muffin tins. Bake 23-27 minutes or until a toothpick inserted in the center comes out mostly clean. Do not overbake! Grilled chicken and green beans. Lately I’d been finding myself both in a dinner-making rut, and feeling lazy about our clean eating; I wonder if the two are related! Then one day I found a new recipe for the most delicious-looking and easy green beans. I’m generally not too good at the vegetable side dish thing, to be honest; I try to incorporate the veggies in the dish itself and serve fresh fruit or salad on the side because I want to do as little extra cooking as possible, especially on a weeknight. But these just looked worth it. So I went looking for a good, and easy, chicken recipe to complement it. And I was blown away by the flavor! Usually you need to marinate a chicken breast for hours to get this kind of flavor and tenderness, but here you just brush on a spice rub that took literally 2 minutes to combine! Suffice it to say, this has become one of my favorite weeknight meals. I serve it with brown rice to bulk up the meal, but you can easily omit that, especially if you’re trying to eat paleo or low-carb. I start the green beans first, and as long as the chicken breasts aren’t too thick (tonight mine were), everything finishes at once. Preheat oven to 425 degrees and line a rimmed baking sheet with parchment. In a large glass bowl, whisk together oil, honey, and mustard into an emulsion until very well combined. Add the green beans and use a rubber spatula to coat them thoroughly and evenly with the mustard mixture. Spread the beans in a single layer on the baking sheet and season with salt and pepper. In a small bowl, combine the spices and olive oil. Brush the spice mixture onto both sides of the chicken using a silicone brush or small spatula. Grill 4-5 minutes to a side until no longer pink in the middle. Enjoy with green beans and maybe some brown rice! 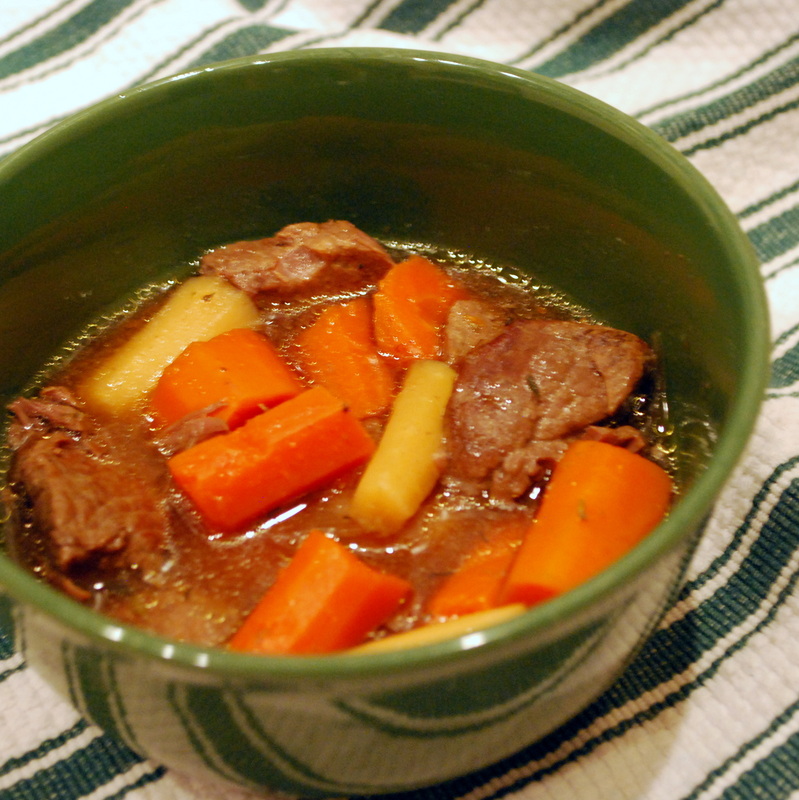 Easy Paleo Slow Cooker Beef Stew. Lesson two: However it may look, this stew tastes incredible. And it’s easy. And clean, paleo, low-glycemic, dairy-free, soy-free, and kid-approved! Heat the oil in a large pan over high heat. Add the beef chunks, season with a little salt and pepper, and sear on all sides. Dump into your slow cooker and cover with the remaining ingredients, except tapioca starch. Cook on high 5-6 hours, or on low 8-9. Optional: if you want to thicken the broth, 30 minutes before the end of cooking time, whisk the tapioca starch with 2 Tbsp water. Pour the mixture into the stew, stirring gently, until distributed throughout, and allow it to resume cooking. Remove bay leaves and enjoy! In the unlikely event that there are leftovers, they reheat beautifully. 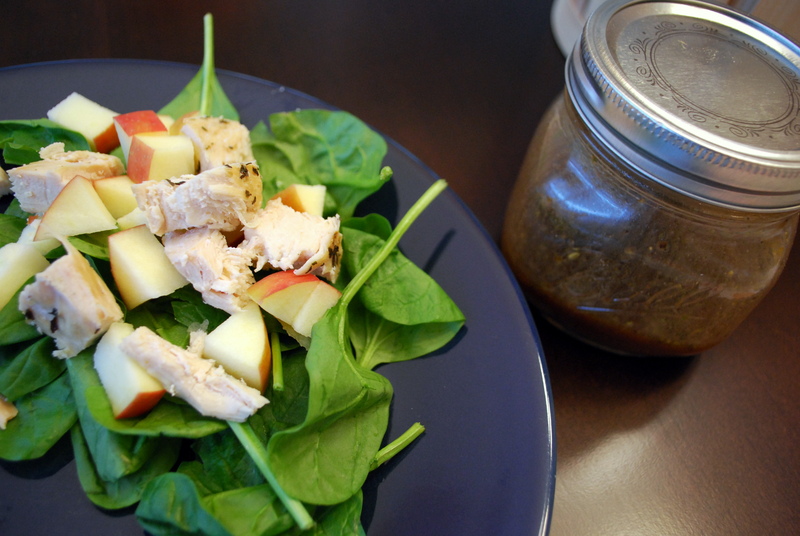 Make-Your-Own Salad Night: Chicken Apple Salad with Balsamic Vinaigrette. What would you say if I told you that, during our time living in Switzerland, Make-Your-Own Salad Night was my girls’ single most requested meal? I wouldn’t have believed me either. Since returning, it’s still one of the few meals that don’t get any pushback or “how many bites?” Because they can make it how they want. Both of my big girls prefer to separate all the ingredients on their plates and eat one at a time. 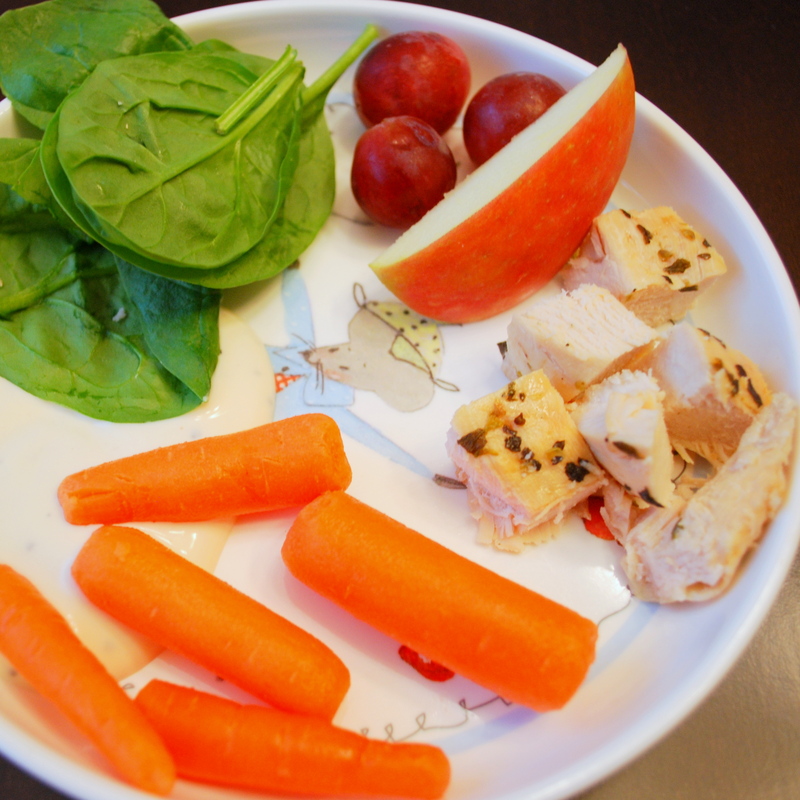 You can make this your own; I’m a big fan of fruity salads, so I just keep it simple with chopped apples, seasoned chicken breast, and balsamic vinaigrette, but I pull out as many of my girls’ favorite raw veggies and fruits as they can fit on their plates, and it all gets eaten! Tailor this to your (and your kids’) preferences and any dietary needs, and every once in awhile, add something that’s a little bit of a stretch for them to let them try: kale instead of spinach, for a start. If making your own dressing sounds intimidating, start with this one. It has 4 ingredients and all you do is shake. Plus, you know what’s in it, and most importantly, what’s not in it. Do you do a Make-Your-Own Salad Night? 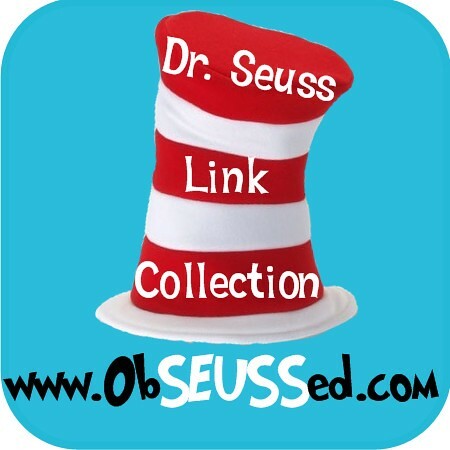 What do you include? 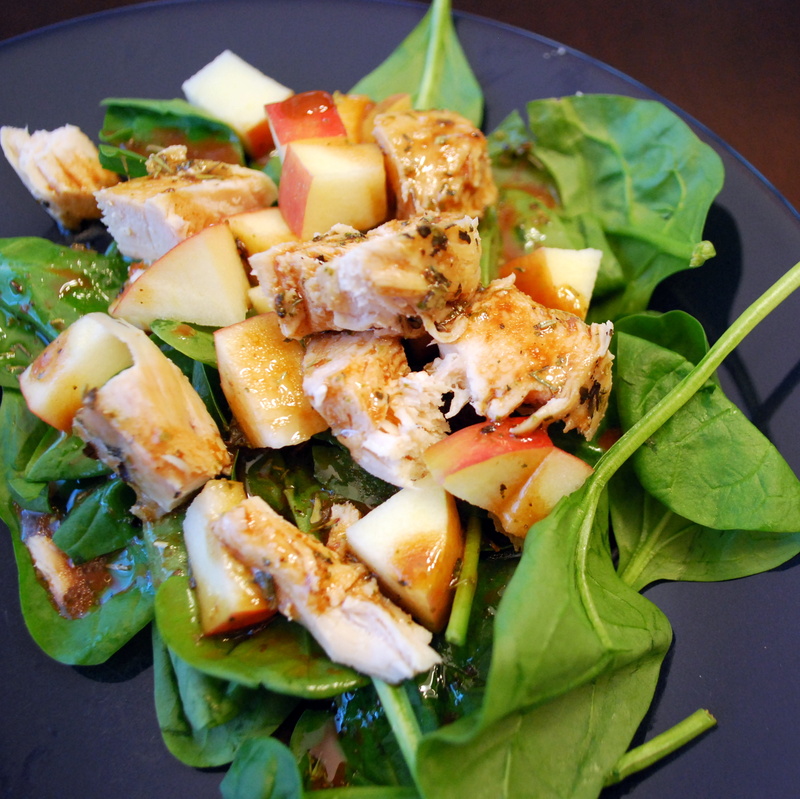 Assemble greens, chicken, and apple. Add vinaigrette ingredients to a jar with a tight-fitting lid; shake vigorously until well incorporated. Drizzle over salad and enjoy!